Poor air quality can aggravate allergies and asthma and create other health concerns. But it's not just the air outdoors you need to worry about. The air in your home can be just as problematic. It's easy to track in allergens as you come and go, and allergy symptoms may get worse in the winter when you're stuck inside the house with those allergens. Even cleaning supplies can clog up the air, especially if you're cleaning in a poorly ventilated area. Air that's too humid or not humid enough can also cause health problems. Too much humidity leads to mold growth, which aggravates allergies, while too little humidity (common during the winter) can irritate your sinuses and throat. Whatever the problem is with your home's air quality, there's technology to fix it. 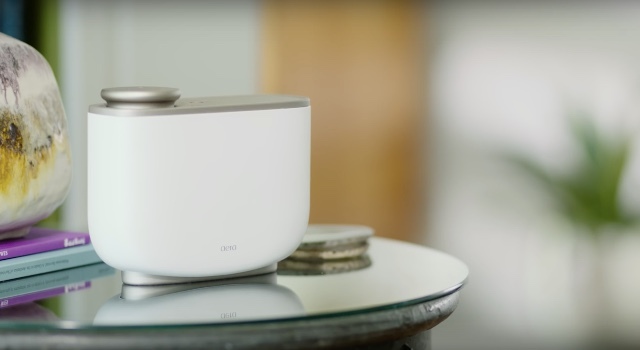 If purifying the air in your home is a concern — and if you suffer from asthma or allergies, it probably is — there are a few things you can try before tackling the problem with tech. The first step: amp up your cleaning routine. Thorough cleaning can help keep irritants such as dust mites or pet dander at bay by removing them from your home. Though you may not think keeping the floors vacuumed or the blankets washed has much to do with air quality, these soft surfaces hold on to irritants that settle there. Every time you take a step or roll over in bed, you're stirring up — and breathing in — the allergens that bother you. Regular cleaning can't prevent allergens and irritants from accumulating at all, but it will keep them from building up to the point they're a serious problem. Sweep and mop hard floors. Depending on the type of vacuum and flooring you have, you may be able to run the vacuum over hard floors as well. If not, sweep or mop to pick up dust bunnies and other grime that's been tracked into the house. A Swiffer, certified to be asthma- and allergy-friendly by the Asthma and Allergy Foundation of America, can be a good investment. Its cleaning cloth picks up dirt you can then throw away without having to stir it up scooping it off the floor. Dust. Just like sweeping, dusting picks up grime that's settled around the house and keeps it out of your air. Don't forget blinds and ceiling fans. It's easy for dust to settle on both, where it's frequently stirred up. Wash bedding, outerwear, throw rugs and curtains. Whatever you can run through the washing machine should have a weekly bath in hot water to kill dust mites and remove irritating grime. If rugs and curtains aren't washable, vacuuming will get rid of accumulated dust and dirt. And while your own outerwear may seem unrelated, keeping it clean will help remove allergens you may be bringing into the house. Another budget-friendly option that can help is regularly replacing the air filter in your air conditioning and heating system. Depending on the type of filter you're using, it may need to be changed monthly. If you're not replacing it regularly, now's a good time to begin. Start using a better filter designed to trap allergens, which helps stop irritants from circulating through the house whenever you turn on the air conditioning or heating. If cleaning doesn't help or doesn't help enough, a home air purifier can remove airborne pollutants and allergens from a single room. Bedrooms are good places for air purifiers because that's where you're likely to spend most of your hours at home. Our favorite is the Blueair Classic 205, which filters out 99.97% of airborne particles, including mold, dust, pet dander, pollen, bacteria and viruses. It cycles the air in a room up to 280 square feet (the size of a large master bedroom or small living room) five times per hour to keep the air clean and fresh. To also kill strong odors like cigarette smoke, replace the standard filter with a SmokeStop filter, a HEPA filter that uses active carbon to absorb odors. Though these filters are twice the price of the standard air filter, at $99.95, they'll help get rid of whatever in the air is bothering you. The Blueair Classic 205 is modestly sized. At 21 inches by 17 inches by 8 inches and 24 pounds, it's not exactly portable, but it could be moved from room to room if needed. Setup is simple: just plug it in to an ordinary wall outlet and turn it on. Place it at least four inches away from walls or other objects to give the air room to circulate. Blueair's HEPASilent technology keeps this device quiet. At just 32 to 56 decibels, it produces less noise than your refrigerator. And of course it's smart. It's Wi-Fi enabled, so you can control it from across the room using the Blueair Friend app (for Android and iOS) or an Apple watch. 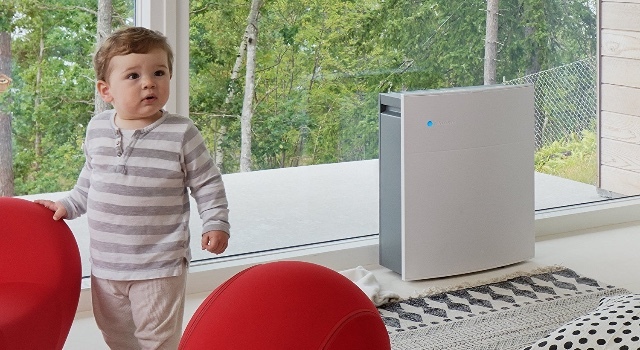 Add the Wi-Fi-enabled Blueair Aware air quality monitor to the package to monitor indoor air quality and track airborne particles and volatile organic compounds as well as temperature, humidity and carbon dioxide, which lets the purifier automatically adjust its cleaning power. Cool air doesn't hold moisture as well as warm air, leaving the air in your home drier during the winter months. The ideal home humidity is between 40 and 50 percent. Anything lower than that can leave your skin, nose and throat dry, while anything higher can cause condensation that leads to mold, another irritant. We recommend a humidity monitor like the AcuRite 01083 Pro Accuracy Indoor Temperature and Humidity Monitor ($14.99 on Amazon) to make sure your home humidity stays balanced. If low humidity is the problem, a humidifier releases water vapor into the air to increase the humidity level. Our favorite is the Levoit LV600HH, which can handle a room up to 280 square feet. The Crane has a 1.6-gallon tank that runs for 20-36 hours, depending on the setting. Operating at between 36 decibels, it won't disturb you even if you're sleeping. The Levoit is simple to use. Just plug it in and press a button to get started. The built-in humidity monitor helps it keep the room at the optimum humidity without any fuss. A large digital screen makes it easy to see the current air condition even from across the room. 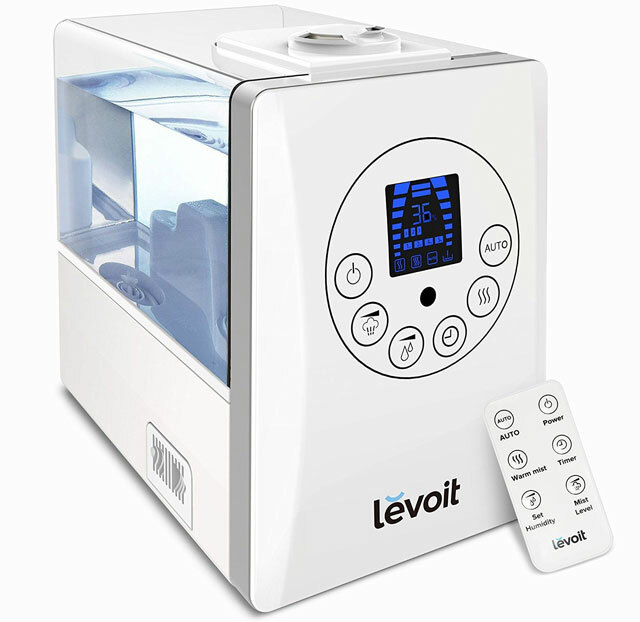 The automatic shutoff turns the Levoit off when it runs out of water, making it a no-worries appliance. The water tanks of humidifiers can grow mold and collect bacteria, so give your humidifier a weekly or even daily scrub with a solution of water and vinegar. The Levoit is built with antimicrobial material that reduces mold and bacteria growth up to 99.96 percent. While you should still clean it regularly, this helps keep it clean and prevents it from putting germs into the air that could make your symptoms worse. The Crane uses washable filter beads instead of a traditional filter that needs to be replaced. You'll want to clean these regularly, too. Air that just doesn't smell fresh, a problem during the winter months when the house is closed up, may not irritate your allergies, but it can feel miserable all the same. You could spray air fresheners or burn candles constantly, but these products only last so long and only scent a small portion of a room. Instead, consider Aera, a device that releases scent — you control exactly how much — that fills a whole room. Aera offers eight different scents designed by perfumers that can fill a room with fragrance for 60 days. This gadget can be controlled by your smartphone. Turn the fragrance level up or down, on or off, from anywhere. You can even set schedules for your Aera to run. The Aera offers complete control over scents in your home that you won't find with any of the more low-tech solutions. This is a great article, thanks for sharing the information. I see on the asthma & allergy friendly web site they have just launched an APP which lists all Certified Products. Hope it is ok to post the links. When item overlooked. Using scents may cause issues with sensitivity and chemical exposure. Natural oils would be one product that would be safer in most instances. You can transform the walls of your home or office into a permanent air purification system, simply by mixing the ionic paint additive by Air-ReNu with paint and applying the mixture to the walls of your home or office. One application eliminates offensive odors such as cat urine, tobacco smoke, pet dander, toxins, and will continue to remain effective for 8 to 12 years. I wanted to say how about having a variety of indoor plants to improve the air quality? Whilst some plants can help remove toxins from the air in your home, their effects are not very far reaching. They can basically remove ‘some’ toxins the very near space around them (like 10ft) and that’s about it. But hey, plants are cheap and you don’t have to replace the filters! I would highly recommend the Rainbow air cleaner & house cleaner to anyone with allergies or who wants a truly clean house. Any other vacuum uses bags or filters, and the problem with these is that when the bag or air filter is clean it allows the tiny dust mites & droppings to go through the bag or filter into the air. The Rainbow uses water to catch the dust mites & droppings & has a hepa filter as well to catch anything that isn’t trapped in the water. This way the Rainbow never spews anything into the air and always has the best pickup, because there is no filter or bag to get clogged. After using a Rainbow for years, I would not settle for anything less than this. I don’t refer to it as a vacuum, because vacuums pollute the air, no matter how good they claim to be.